The Nikon SB-700 Speedlight Flash sports many of the features of larger flashes, such as the SB-910, but in a smaller form factor with simpler settings. The main compromise with this flash is that it is optically triggered only, meaning that you will not be able to fire it wirelessly with radio transmitters, like Pocket Wizards. You must either fire this flash from your camera's hot shoe or use your camera's pop-up flash as a master. Alternatively, you can fire this flash wirelessly using the Nikon SU-800 Speedlight Commander. If you'd like to use this flash off of your hot shoe without using optical line-of-sight triggering, you can rent the Nikon SC-29 TTL Off-Camera Shoe Cord. For the size, this flash is powerful. The auto zoom head has coverage for focal lengths ranging from 24-120mm on full frame cameras, which can be extended down to cover lenses as wide as 12mm with the help of the built-in wide-angle diffusion panel. The light's distribution angle will adjust automatically for crop frame sensor cameras. The SB-700 has a fully swiveling head, a high-speed/strobo mode for action and outdoor work, and a distance range of up to 66'. The recycling time on this flash is 2.5-3.5 seconds and cannot be made any quicker with the help of an external battery pack (see notes) – so this flash might not be the best option if recycling time is paramount (see our strobe collection for the fastest-recycling lighting options). 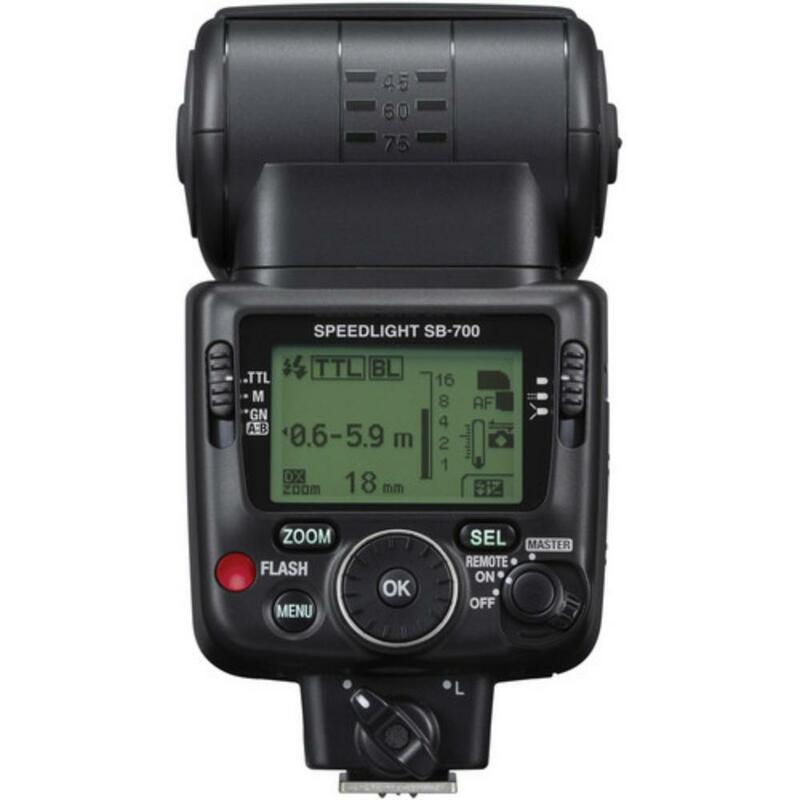 The SB-700 is ideal for beginner portrait photographers, events, and traveling. • This flash requires 4 AA batteries to operate and they are not included. There is no port on this flash for an external battery pack. If you want to use a Nikon SD-9 battery pack or Quantum battery pack, then please consider a larger flash, like the SB-910. • Filter attachments are not automatically included with your rental. If filter attachments are needed, please say so in the notes. • This flash is not recommended for use with fisheye lenses of 12mm or wider. Use of this flash with ultrawide lenses may result in unwanted shadows. • This flash is not compatible for use with IX-Nikkor lenses. 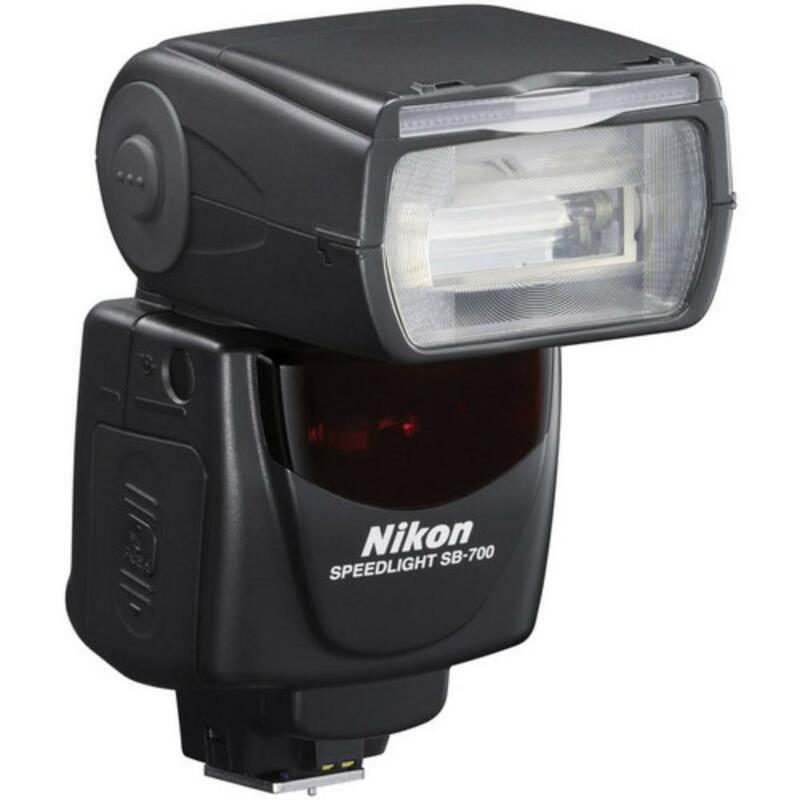 • Pop-up flash on most Nikon DSLRs will command this flash off-camera optically, as will the Nikon SU-800 Speedlight Commander. This flash can only be fired optically. It does not have a radio transceiver option and there is no sync port for connecting a Pocket Wizard. If you'd like to use this flash off of the hot shoe without using optical line-of-sight triggering, you can rent the Nikon SC-29 TTL Off-Camera Shoe Cord.